Curious what our show looks like? Check out our program and offerings from 2018 below. We are currently working on the 2019 festival and will update this page in the spring! Step back into the Middle Ages to the time of daring knights on horseback, fair maidens, mischievous sprites, and jolly jesters! Meet Robin Hood and his band of Merry Men! But don't let the Sheriff of Nottingham see you! Click the booklet cover above to view 2018 Program. What Entertainment, Spectacles and other amusements shall thee encounter within our gates? Prithee read on! Full Contact Joust - Knights on horseback! Chariots! Fierce swordplay! Cu Dubh - thunderous drums and stirring bagpipes! Cirque Du Sewer - trained rats and cats! Aye, really! Wheel of Death -- one brave man on a Giant, 30 foot high, Spinning Wheel! Vixens En Garde - fierce witty women, swords, & Shakespeare! Blades of Death - with luck, no bloodshed on St. Bonaduce’s Day! Birds of Prey - see falcons, hawks, up close! Free Archery - try your hand at what Robin Hood does best! And these are just some of the highlights, see the full list below! The Mutton and Mead Medieval Festival features over 50 shows and spectacles for your enjoyment! To see our (nearly) complete list read on. Have children, check out our Children's Path suggestions. Want to see some video samples, visit us on facebook here! AMAZING FLEA CIRCUS Gaze upon a spectacle of miniature proportions, following its tiny hero through an adventurous day of performing incredible circus feats by means of brilliant theatrical tricks. Presented in actual size by the Sandglass Theater. AyreCraft brings authentic music of the Late English Tudor and Jacobean courts as well as traditional music of Scotland and continental music of the early Baroque to your ears using instruments that are close replicas of the period. Comprised of longtime early music performers Donald Cotter (Tenor), Margaret Pash, (Lute and Viola da Gamba) and Robert Castellano (Lute and Theorbo) and often joined by Christopher Stetson on lute. BELOW THE GAFF will put a jump in your step with their lively tunes and a groan in your belly with their bad jokes which they promise to be still amusing. Dance along to traditional Irish folk songs, sea shanties and original pirate tunes. BLADES OF DEATH is a comedy knife-throwing show featuring Ichabod Wainwright and his assistant Samantha Stagewonder. Together they will perform feats of balance on a 16-foot high chair stack! Juggling knives, and maybe a little magic for good measure. The Blades of Death show is the only touring show in the world to feature knife throwing at a human target from a slack rope! Simply a must see! CARAVAN DANCERS return yet another year, from the farthest lands of the realm! They showcase two distinct performances inspired by music from long ago and far, far away. Live musical accompaniment by Diabolis in Musica & Cu Dubh. CIRQUE DU SEWER, the Acro-Bat with Acro-Rats and an Acro-Cat! Probably the only Circus in the world of its kind, Cirque Du Sewer features the circus skills of Melissa Arleth and her amazing trained vermin. The rats jump through flaming hoops, complete obstacle courses, and join Melissa on her slack rope for a finale that is truly unique. They are like Cirque du Soleil -- only less Canadian. CU DUBH (Coo DOO) mixing eastern instrumentation and dance rhythms played on thundering Turkish war drums with dark original compositions played on Highland Bagpipes, they have carved a unique sound that calls back to ancient Celt brethren. DIABOLIS IN MUSICA blends medieval melodies and instrumentation with modern and international flavors, with a multicultural repertoire that draws from ancient tunes from Europe and the Middle East. Their name is drawn from 6th century’s Pope Gregory’s declarations outlawing of certain musical harmonies as “diabolis in musica” -- the devil’s music. It was... the Rock & Roll of the Dark Ages! ED THE WIZARD pulls magic from the air while wandering the shire streets. Experience the mystical ministrations! ENCHANTED FOREST -- Venture and stroll along the path into a magical place! Meet faeries, sprites, trolls, pixies, and other mysterious dwellers of these majestic woods. Come to the Enchanted Gathering! And be on the lookout, as there might even be a Parade bringing the faeries out of hiding and through the entire shire! FAERIE TALES & STORIE TYME invites shire children to a storytime gathering with a twist -- your children help write their story with the faeries! Interactive storytime for all ages. Saturday: Raven Moon. You’ll hear tales of giants, faeries, and more! FLIGHTS OF FANTASY -- Ladies Serenity and Modesty tell stories and sing songs about brave heroes and heroines, and misunderstood dragons. HARPER’S HALL may be found strolling the streets filling the air with sweet music and at their Harper’s Hall! Piper the Pied Harpist pauses in her strolling to welcome students of all ages to explore the Celtic Harp, with miniature harps circulated for the young harpers-in-training! Embrace the Harper inside you, explore different harps, learn some “string theory”, and dress the part for a portrait! Come find us! JOLLY JESTERS will amaze you! This is a Medieval Circus that will delight all manner of folks with their feats of dexterity, juggling, balancing, tumbling and acrobatics, spiced with buffoonery. Partake in their juggling on-the-fly lessons! JOUST! 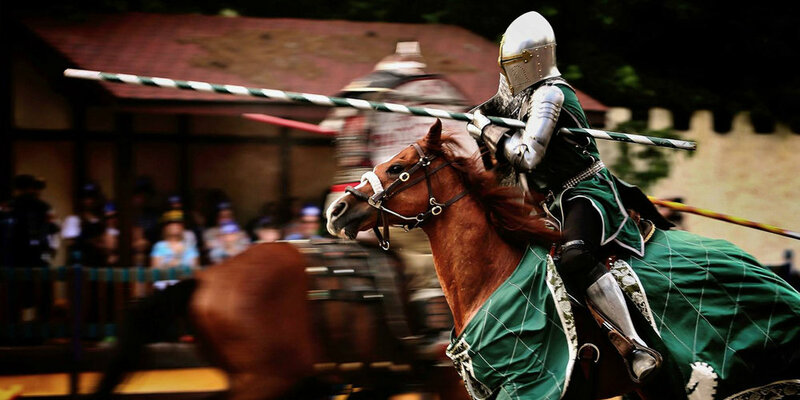 Witness sword fighting, death defying stunts, trick riding, two-horse chariot, ladies in majestic gowns, the grandeur of warhorses, and all the pomp and pageantry you expect in a Royal Joust. Step back in time and be part of an event fit for kings, queens, and commoners alike! By DeBracey Productions. Kasper and the Cow Enjoy a funny adventure with Kasper, beloved hand puppet hero of Germany, who is known for his stocking cap and audience-engaging humor. Kasper packs to go on a journey, but before he can leave, a cow steals his suitcase. With the help of his best friend, the endearing giant Augustin, Kasper has to go on a rollicking chase to reclaim his suitcase from the cow. The Kings Busketeers This trio of traveling troubadours will charm you with their rousing drinking songs, love and murder ballads, and roguish humor. L.I.A.R.S. The Ladies of Integrity, Aristocracy, Repute, and Society are a troupe of reformed wenches with delusions of standing. They find their delight in bringing song to every corner of the world they visit, and Nottinghamshire is no exception. Pop by any of their stage shows, or find them while busking, and let the Ladies serenade you with their lovely harmonies, or raise your spirits as they merrily sing traditional folk music. MISFITS OF AVALON -- featuring Brian Weiland on the ancient and enchanting hammered dulcimer and mandolin, and Max Cohen on guitar and vocals. Be delighted by beautiful and uplifting sounds of traditional contemporary Celtic music. MORRIS DANCING in a variety of styles will be performed throughout the day by various groups in the area. Past Times Present is a duo of singer, songwriter, storyteller historian musicians who bring the past to life through interactive encounters of a living musical history kind. Their ditties will tickle you as their wit charms you. THE PENNILESS JACKS The Penniless Jacks are charismatic purveyors of pub music. Whether it be centuries-old shanties, boisterous drinking songs, rousing rebel tunes, or ballads of love, The Penniless Jacks will have you singing, clapping, and stamping along to their unique sound and energy. ROBIE BONES performs on variety of instruments including cow rib bones, pipe and tabor, wooden whistles and bodhrans. Be drawn in … try your hand at some music yourself! ROOTED REALMS in the Enchanted Forest is a New England based collaborative project featuring dancers, actors, acrobats, artists, and musicians from the region. SKELETON CREW THEATER brings magical and monstrous beings to life -- meet Trolls, Fates and a living, speaking Tree. VIXENS EN GARDE -- Beautiful women armed to the teeth bring Shakespeare to life! This fast-paced interactive swordfighting comedy show will keep you on the edge of your seat as only the Vixens En Garde can! WHEEL OF DEATH is a high flying acrobatic stunt show featuring the worlds-only Wooden Wheel of Death and the master of momentum himself, Ichabod Wainwright! Ichabod will run, jump, flip, and juggle flaming axes all while running around his 30 foot tall Wheel of Death! WOLFGARD NORTHEAST Through art of immersive storytelling, Wolfgard Northeast transports you back in time to a world of wolves, shapeshifters, and other wild things. Explore wolf mythology from horizons near and far. Sample program from 2017 below. View the 2017 Festival Program Here!